Two weeks old in this photo above and I'm in LOVE! 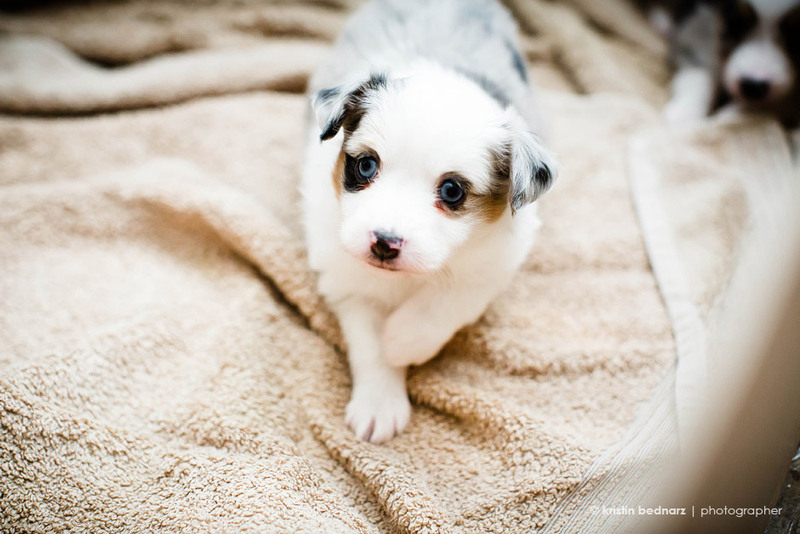 I've started photographing sweet baby puppies and it's the BEST. You show up, snuggle them, photograph them, love on them and then leave and go home to your adult dog that is potty trained. What's not to love? 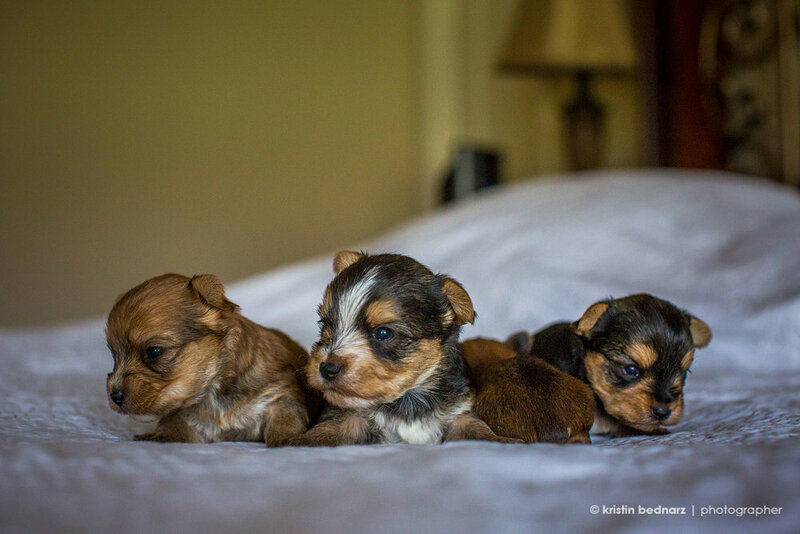 If you are interested in a sweet baby Yorkie, head to www.yorkielicious.com for info. I photographed a beautiful rescue dog today. Her name is Doba. I hope I'm spelling this right. She's a rescue dog that lives in Orchard Park. She's 1/2 heeler and 1/2 Aussie. Super soft and pretty and oh so loveable. I just returned home from scratching these fine puppy butts! How cute are they! I like it when people want their dogs photographed. After all, they deserve portraits, too. They are part of our families. I know mine is! Devin doesn't like to think so, but she is. Go Kanga! Cameron, above, belongs to that soft furry creature in her hands, Woodrow. We met earlier one morning for some pictures to surprise the other human that Woodrow loves. It's been a while since Kanga had her puppies. A LONG while. Her last litter was born March 17, 2013. I was diagnosed with cancer a few short weeks after and started treatment by the time the last puppy found a home. Her "puppy making" days were over at that point and I've missed having them around. So, when Casey, our neighbor and good friend told us about his toy aussie litter, I jumped at the chance to go and visit them. They are just as adorable and cute and sweet as you would think a new puppy would be! They are about 1 month old at the time of these photos. So, so soft! And oh so cuddly. I think he has a couple left that need a home, so if you are interested, please let me know and I'll introduce you two. We've been puppy sitting one of Kanga's sweet babies. Her name is Mia and she belongs to Coach Dilley. We got to watch her over the weekend and had soooooo much fun! Kanga did, too, but I'm not sure Mia had as much fun as Kanga. She's looks just like her momma and in fact? I would get them confused when looking down on them because they look so much alike! I think our neighbor also got a new puppy. So stay tuned, you may see more puppy pics! We have one puppy left. We call her Darcee. She's a black, tri-color female and absolutely the cutest thing! I thought I would share photos only of her and see if anyone is interested. Herre's a good shot of the ENTIRE litter. They are so much fun! But I am getting a little tired of the pee puddles. If you are interested in seeing Darcee, just text or email me. She's such a good momma. The puppies are 3 weeks old now and everyone has their eyes open. I'm officially posting my "Puppies for Sale" sign! $250 is required to hold your puppy. The rest is due on pick up date, April 25th. They should be eating on their own at that point and doing great! If it's earlier, I'll let you know. If you'd like to pay cash or check, just contact me at the info below. Oh, and if you'd like to come and love on these cuties, come on by!!! They are adorable!!!! I had a cup of coffee with these two. Kanga was hit by a car today. But she's going to be OK. I knew better. But I did it anyway. I just figured it couldn't happen to us. She's smart. But I think she was chasing that black cat she barks at all day and she took off across the street and was hit. I immediately took her to Above and Beyond where they took care of her. She's resting and yes, will need some mending, but she's OK. Yes, my children mean more than this dog, but that doesn't mean this dog doesn't rank pretty darn high up there. I get to bring her home tomorrow pending a good report and blood work in the morning. But I would appreciate your happy thoughts and prayers. Well, in all honestly, not quite yet. All four are still here. But two are going to be picked up soon and we'll be a smaller household for a while. The rest of the family? Not so ready. 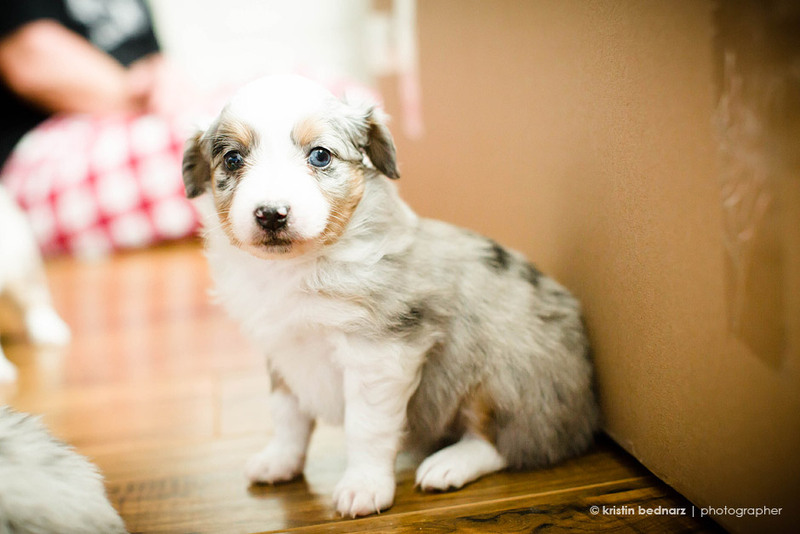 We still have two Toy Australian Shepherd puppies for sale. Kit on the right in the photo below, and Izzie. Of course you can name them whatever you wish. Izzie and Kit seem smaller than the other two. When I was bathing everyone this morning, I got a good look at their wet bodies and these two have shorter legs. I'm thinking they will most definitely be toy in size. Izzie, below, has really settled into a sweet puppy. She loves to cuddle and when you pick her up, climbs up to the nook under your neck and settles in. She would LOVE to lick your nose and neck but is simply content to lay. I love that. Kanga still loves to do that. She's still very energetic, but does sleep quickly. I noticed that yesterday when putting them all into the kennel before I left for work. Within seconds she had found a spot to lay, belly down, legs out and instantly went to sleep. Sure, she whines when we leave the room. But not for long. And she's eating her food just fine. And this may be TMI for the blog, but when she "tinkles", there's less tinkle than some of the others. Which also makes me think toy. You know, smaller bladder. Here eyes are still bright blue, however the right one has two colors. A darker blue and a bright blue. I think her daddy had that as well. Not sure. I will have to ask his momma. Kit is still the leader of this pack! Which is so darling since she was the last one born and the runt of the litter. She too is smaller than the rest, but her and Izzie are about the same size. Her eyes are still blue, however, I honestly think they will turn amber. Who knows. Her fur is still soft and getting thicker and thicker. And I love that her nose has the one spot like her momma! So cute! She follows me EVERYWHERE going from room to room exploring and fearless. She loves to run and jump and play! She's the first to eat and nurse still, but I also find her the last to fall asleep. I think she's afraid she will miss something. She's super quick to pick things up. I started clicking my nails on the hard floor when I want their attention and now she will come to where I'm sitting and crawl on my legs for a cuddle and a scratch. You can watch her little face relax when you scratch hard behind her ears and she even gets still and just sits. But if something's going on, she's off to explore! Drinking water and loved her bath! I think it's more the scratching and the rubbing than anything. I list them in the paper today. So I expect them to sale quickly. If you'd like to purchase one, Kit is $600 and Izzie is $750. Someone asked me why the difference. It has to do with the markings and their coats. You can read more about Toy Australian Shepherd Puppies, HERE. We have two puppies for sale. The females are left. They are exploring the house and moving around and developing their little personalities. So cute! I thought I would talk about them a bit and give you the link to their facebook galleries. They've had so many visitors and people interested in them. They are eating soft food on their own, but still nursing on momma 3-4 times a day. She's losing patience though as they get bigger and their teeth get sharper! I can't say I blame her. It's so taxing taking care of babies. If you are interested in seeing these precious babies in person, just contact me and you can come sit on the floor and play. That's what I do a good part of the day. I hope this helps those of you interested in making a decision on your favorite pup. Read under each photo posted for their description and make sure to click their facebook gallery link. I'll post more photos on Monday. She was the last one born, feet first and the smallest of the litter. The first week of life, I let her latch on first to get going and maybe catch up with her litter mates. It's worked! She's been the first one to stand, to walk on the slippery floors, to start a fight, the first one to start everything. She can really be a handful at times. I'm not sure if she will be toy like her momma or miniature like her daddy, Ty, There's really no way to know. But if I had to guess, I'd say toy. And her hair will probably lay flat like her momma and grow long. Kanga normally has a skirt all the way around her. And her hair is very soft, like a bunny. Her eyes will most likely turn amber. They were bright blue up until this week and now they are getting darker. If you are looking for a highly energetic smart dog, Kit is for you. CLICK HERE for a link to her facebook photos. She has thick, soft hair and definite blue eyes. She's Gorgeous! I think the's the lady of the bunch and wired much like her brother, Hooey. She's very laid back and soft under the coat. She eats calmly and plays a lot although she is never the one to "start the play fighting" if you know what I mean. She loves to be cuddled and is cautious about trying things out. She usually follows her sister's lead. I think she will be miniature in height, like her daddy and have a longer, bushy coat that seems fluffy compared to Kanga. If you are looking for a laid back dog that enjoys a good cuddle, Charlotte is the one for you. CLICK HERE for Charlott'es Facebook Gallery. Oh, Izzie! You spitfire of a pup! You know how puppies will act wild and start hopping and barking and just moving around like crazy? That's Izzie! She's the first to wake up and the first to latch on. She has the markings like her sister Charolotte, but definitely smaller in size, but NOT temperament! She's wild! She barks, growls, snarls, and moves like crazy. She does love a good cuddle, but not for long. And you have to watch her closely because she always seems to be stuck somewhere she shouldn't be. Her and Kit were the first to wander out of the nesting room, my office. And the first to greet you when you come in the door. She loves a good chase and a good scratching. I definitely think her eyes wills stay blue, and I think she'll stay toy. But there's no way of knowing for sure. And her fur might go flat like Kanga's and silky. Her face is absolutely ADORABLE! She's the "teenager" to Charlotee's "lady" if you know what I mean. Definitely fearless and ready for adventure! CLICK HERE for her facebook gallery. You remember our puppies, right? 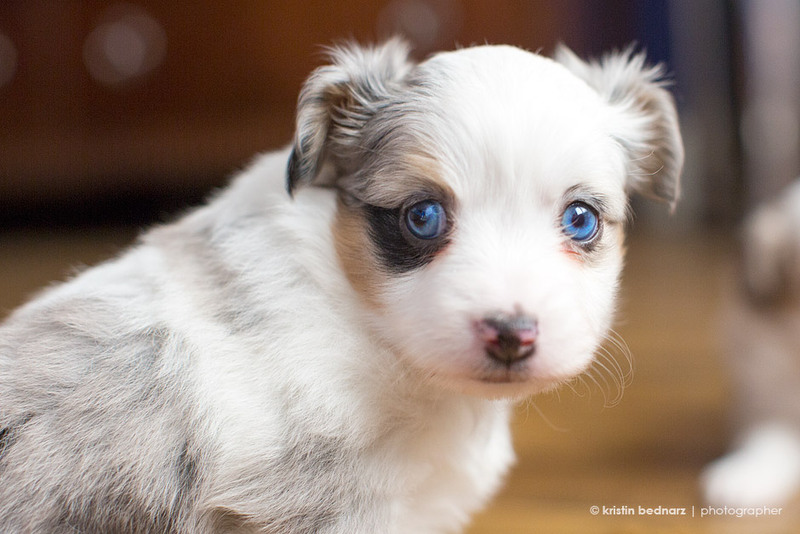 Their momma, Kanga, is a Toy Australian Shepherd. 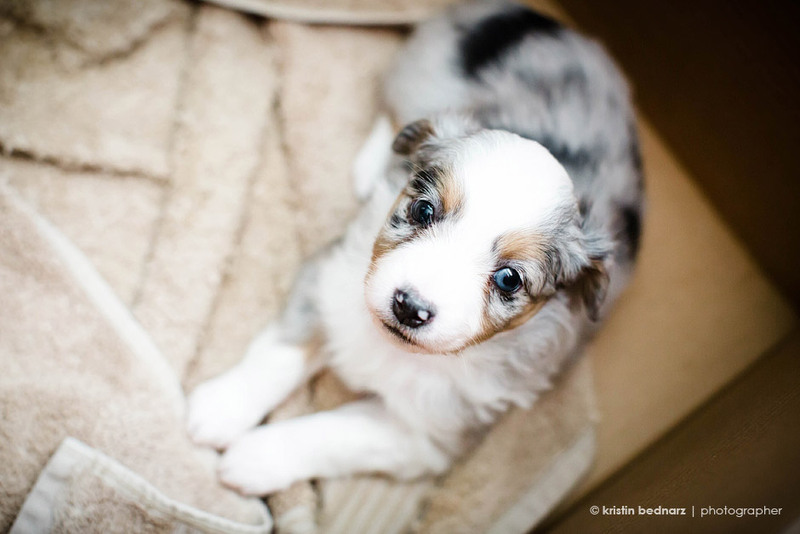 Her "boyfriend", Ty, is a Miniature Aussie. I've been getting lots of questions about them and the differences. Here's what I found out. At this age, we can't tell if our 4 babies are going to be toy or miniature. We definitely don't think tea cut, although Kanga barely weighs 12 pounds wet. You can tell from the photos above what she looked like at 14 weeks. She was so cute, but such a scrawny thing. I can't imagine her looking like this when she was a puppy, but I've been told she did. Only different coloring. The one featured here is Charlotte. She's beautiful and her coat is thick and soft like a bunny. Her personality is much more laid back than her sisters Izzie and Kit. But she fits in just right with Tycoon, our one and only male. She's very squishy and loves to be held, while her sisters are much more muscular from all their extra puppy wrestling. They are pretty darn good at a "take down", let me tell you. And the toe chewing while I'm blogging this? FIERCE. Anyone interested in purchasing a puppy, they will be ready to take home January 14th. $250 is required to "hold" your puppy with the remainder due when you pick your puppy up. They will have their first shots and will be eating soft dog food and weaned from their momma. She's only nursing them 3-4 times daily right now. They've been eating the soft puppy chow for a couple of days and doing great. We are working on the puppy training, meaning we have "places" around their area designated with padding for "bathroom stuff", but it's hit or miss and they are really too young. But hopefully, in the next 2 weeks they will progress in that department. If you'd like to come by and hold a puppy, even if you don't want to buy one, you are welcome to come puppy sit and let them chew on your toes.